© Mori Trust Hotels & Resorts Co., Ltd. All Rights Reserved. 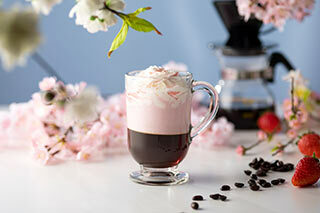 With cherry blossom and fresh greens that symbolize spring as a theme, we offer dessert beverages SAKURA and WAKABA featuring spring-hued and fragranced jelly with a pleasant texture. This colorful SAKURA is reminiscent of the arrival of spring. 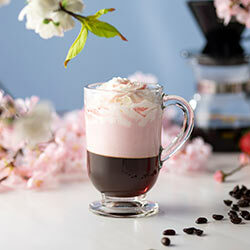 Enjoy the strawberry-flavored milk with a soft aroma of cherry blossoms and jelly made from GGCo.’s signature coffee. A Japanese-style soda beverage featuring handmade matcha green tea mixed with club soda and a semi-sweet peach syrup. 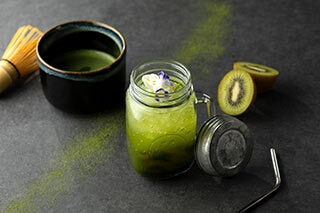 Enjoy this innovative dessert beverage together with kiwi jelly for a refreshing sweetness that contains lumps of kiwi fruit.